Prominent & Leading Manufacturer from Mumbai, we offer glass films. 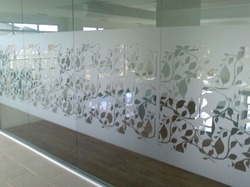 We provide exclusive customized opaque and Decorative Glass Films. Our product Glass Film is widely known in the market for the optimum performance and attractive looks. These glass films are highly used in the door glasses of bank, offices and institutes. All our glass films are finished finely and quality inspected by our experts on different parameters. Our experts have prepared these Glass Films by using pure quality chemicals which are safe to use.